Last month, my wife and I finally fulfilled a bucket list item in probably our last chance to do so - we rode the Cassiopeia train from Tokyo (Ueno) to Sapporo. It took us years to finally get tickets, and we had to pay through the nose for them. Above is the full video chronicle of the trip. 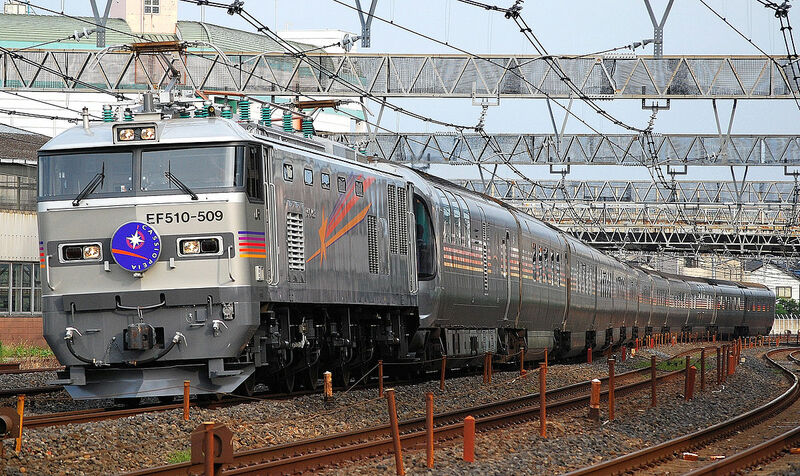 This train is the last scheduled service in Japan to offer a dining car, and it might be the last overnight train making regular runs between cities. (There's a budding "cruise train" industry there, but these trains don't really go anywhere... they just kinda drive around for a while.) Cassiopeia's being discontinued next year once the first part of the Hokkaido Shinkansen opens up, so it was now or never. We bought our tickets through Yahoo! Auctions - and yes, there was a bidding war. We didn't actually get the "Deluxe Suite with View" pictured here - it's impossible. You can probably see why. This is the only room like this on the train. And what a beautiful train it is - all shiny and silver and clean, and a perfectly matched set. It hearkens back to the days of streamliners in the United States. I've been taking long-distance trains all my life in the States - I love it, though I never lived through those glory years. I do have some built-in expectations from that Amtrak experience. In a lot of ways, it was surprising how similar riding Cassiopeia was to riding any of Amtrak's long-haul trains. Of course, like everything else in Japan, in other ways it was a different world. Cassiopeia's terminal stop in Ueno is really nothing special for what's reputed to be a "luxury" train. There's certainly no red carpet, and the only waiting area is a small set of plastic chairs - it looks like any commuter stop. Immediately I noticed people lining up in a certain spot, but neither I nor my wife knew why, so initially we ignored it while I took video and pics. Too bad! Turns out the line was for the shower signup, and it was ridiculous. Once the train arrived, an attendant in car #4 started taking names for the public shower. This took forever, I mean I got in it 30 minutes before departure and I was worried we wouldn't even actually make it onto the train before it left. This is the front of the line above - we still hadn't even made it on the train at this point. Of course, by the time we got up there, shower times were all gone. All that waiting for nothing! I had also wanted to take video from our room as we left, but I had to get it while standing in line. This became a theme for the trip. Here's our room from the outside (this was actually in Sapporo, which is why only this picture looks rainy). The steps up to our room! We were in car 7, room 22. The train is bilevel, and luckily our room was on top. There's a little spiral staircase that takes you up there. Unlike Amtrak, Cassiopeia's rooms have a combination lock, so you can leave your valuables in there without worrying about it. Otherwise, the room was extremely comfortable, with plenty of space to stretch out. It was laid out slightly differently but the total amount of space was easily equal to or better than an Amtrak bedroom (not the roomette). Unfortunately some of the space is wasted while you're awake since it's just there to put your feet while sleeping; one person sleeps lengthwise while the other sleeps widthwise, and your heads meet in the middle. But I still had no complaints at all about comfort or space. My wife's become a big fan of overnight trains since meeting me. She'd never experienced one before (like most Japanese these days, she just took the shinkansen or flew everywhere), but now she loves it as much as I do. So she asked the conductor why they were discontinuing the train when there was obviously so much demand - why not just raise prices? The conductor told her the trains are actually getting old, and a lot of things are breaking down. Of course, by Amtrak standards the Cassiopeia is practically brand new, but this is Japan - 16 years old is ancient, and honestly Japanese trains aren't built to last. So it made some sense to think that maintenance might not only be a rising cost but also a problem in keeping the trains running at all. There are only four sets, so they all need to be in running condition to make the schedule. 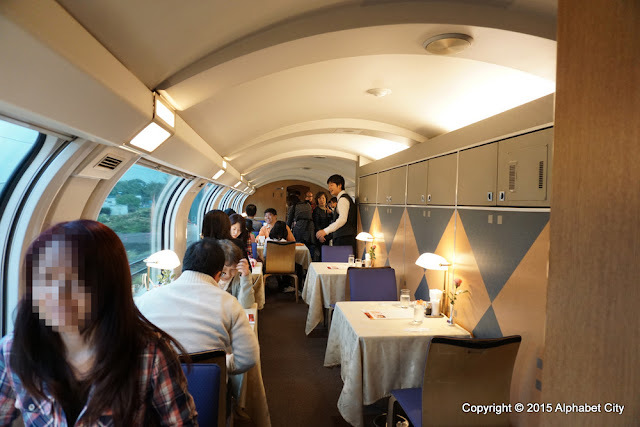 After our conductor checked our tickets, we headed to the lounge car, which is a real observation lounge in the style of something like the old Milwaukee Road Skytop Lounges. At this point of the trip it was actually hooked to the front of the train, but interestingly enough the Cassiopeia makes several directional changes along the way, giving both passengers in the lounge and in the Deluxe Suite at the other end of the train a chance to have an unobstructed view for part of the trip. There are three engine changes, and each time they just hook the new engine to the other end of the train. We knew already that we would need to wait to eat in the dining car until after the main dinner seating. You basically have to make a reservation when you buy tickets, and we couldn't do it while outside Japan, so they were sold out by the time we landed at Narita. After the regular dinner service they have 45 minutes of "pub time" where you can get simpler meals without a reservation. We asked our car attendant if it's necessary to line up and he recommended we do so 15 minutes ahead of time. We tripled that and got there at 9PM - and we were glad we did, because we managed to get a table for two, while not everybody behind us got in at all. 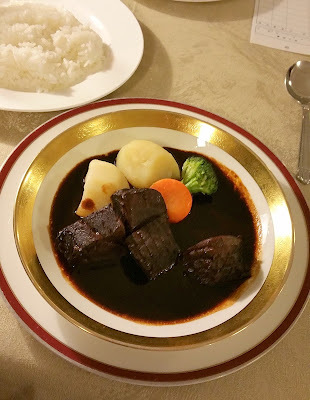 I was totally happy with my meal (beef stew with rice) while my wife only had an order of sausages because she'd already eaten some "ekiben" just in case we didn't make it in. It was really nice having a table for two in a dining car - this is not something Amtrak offers. (On the other hand, there's virtually no chance of not being able to even sit in an Amtrak dining car.) There's no way to really have a romantic meal in the dining car on an Amtrak train - every meal is a social event, with strangers at your table. After dinner, we made our beds and tried to sleep. I have a hard time sleeping on trains because of the "surprise" bumps that inevitably happen - any time we hit a particularly strong bump or lurch to the side, I wake up. Also any time we stop. Or go slow. Pretty much anything outside of normal smooth running at high speed will wake me up. So I was in and out of consciousness all night, despite what felt like a long stretch where we were going about 10mph. I found out the next morning that they had padded the schedule with an extra two hours vs. the online schedule I found for this train - so I guess they expected it, but I thought we were late for most of the morning. Overnight, the train goes through the Seikan Tunnel, the longest undersea tunnel in the world, and the deepest. I heard and felt it, but was dozing at the time so I didn't pay much attention. I was a little afraid of waking up, because honestly being under the actual ocean kind of freaks me out. After breakfast, we hit the lounge car again one last time, both for the experience and to see the new power we'd acquired overnight. This train starts with a purpose-built EF510 electric from Ueno (usually in Cassiopeia colors, though ours was in the blue Hokutosei scheme), then an ED79 diesel-electric overnight, then a couple of DD51 diesels for the non-electrified rural sections of Hokkaido. The lounge car was fun but there was something weirdly stressful about it - it always feels like there's somebody waiting for the seats in front of the windows, and there's no real reason to be in any other seat vs. your own room. The windows are no larger. As on Amtrak, we were actually mostly happy with being a little later than we'd originally planned. It gave us a couple of hours to simply relax in our room, which we hadn't really been able to do before. I felt quite busy on this train. It's a pretty short trip for a long haul train - about 16 hours, much of which is overnight. So with all the waiting in line and then meals, shooting video and photos in the lounge car, etc. we didn't have a lot of time to just sit and watch the scenery. And Hokkaido is when you finally get out into nature. We arrived at Sapporo "on time" (2 hours later than the original schedule) and stayed to take some photos and watch the train leave. My wife told me she even got a little melancholy watching the train pull away, knowing it would be gone for good in just a few more months, an entire era of Japanese train travel gone with it. 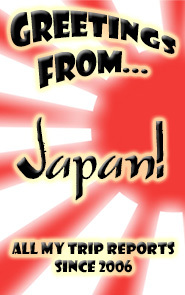 Japan is a small country, and this is about as long a journey as it can have. For the Japanese, 16 hours on a train must feel like forever. For someone who's taken Amtrak across the entire USA, though, I actually felt a bit rushed on the Cassiopeia. One of my favorite things about long haul trains in the USA is the feeling of having nothing to do - being able to sit in the lounge or your own room and read for hours, getting out at fuel stops to stretch your legs for a while, and seeing the vast stretches of the United States that are empty, punctuated only by natural wonders and the animal inhabitants that call it all home. There's a feeling of quiet and serenity that you get on an American train that was missing on the Cassiopeia. 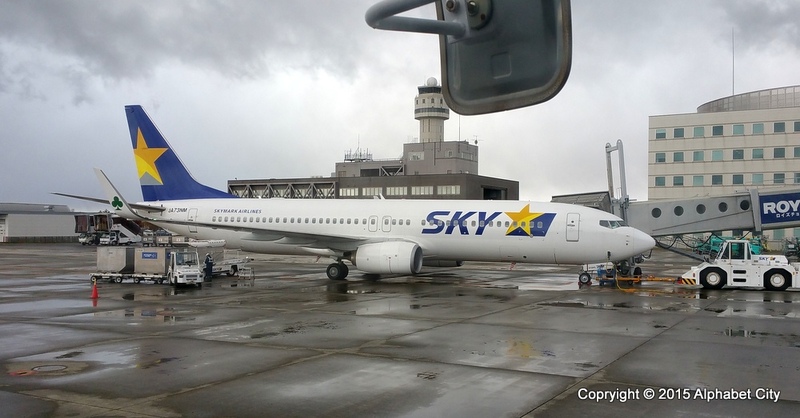 A little writeup on our day in Sapporo is next up! My wife's been a Chara fan for many years, and she's been a fan of the film "Swallowtail" almost as long. In that film, Chara plays a prostitute who becomes a singer as her little group of gangsters tries to go legit, opening up a live house (rock club) in the process. The house band is known as "Yen Town Band". It was a fictional band created just for that movie, but this year they're going out on tour. It's kinda like Spinal Tap, except Chara's a real singer and it's not a comedy band. My wife and I saw them at Zepp Tokyo on October 22. 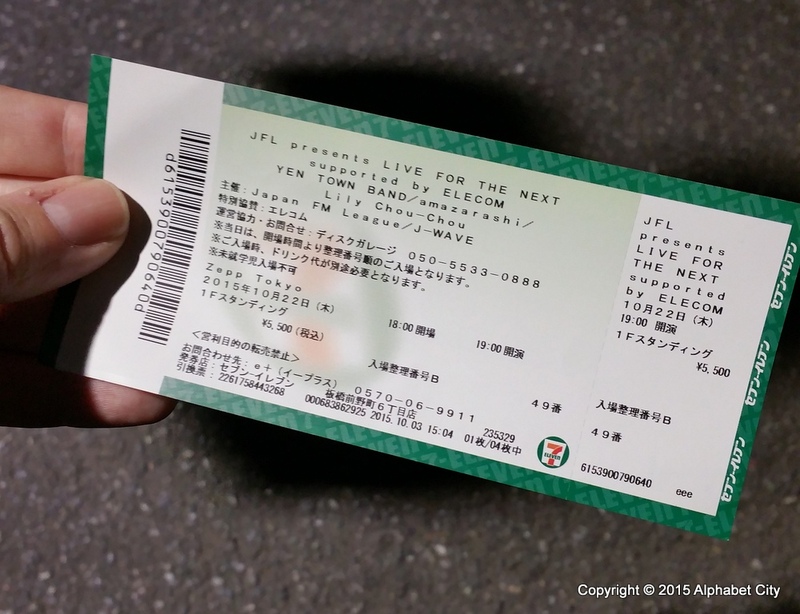 I'll talk a little about them but since I don't know all that much about Chara, I thought I'd use this post to also talk more about the process of going to a Japanese live house show. It can be a little daunting and really confusing for a westerner, because it's so different than how these shows work in the US. So I saw SCANDAL for the fourth time in four years on this trip, which is pretty unbelievable, to be honest. I never plan it out; they just always happen to be playing when my wife and I go. This time they were doing some kind of special show for the annual Tokyo International Music Market with Androp, who I'd never previously heard of, and FLiP, the guest opening band. By now I've been to several Japanese concerts but this was my first "live house" (aka club) show as a member of the general audience. (I'd previously seen Aldious as a guest of the band). It was at Zepp DiverCity Tokyo, not to be confused with Zepp Tokyo (where the "Everybody Say YEAH!" DVD was filmed), although they are literally a few hundred feet apart. 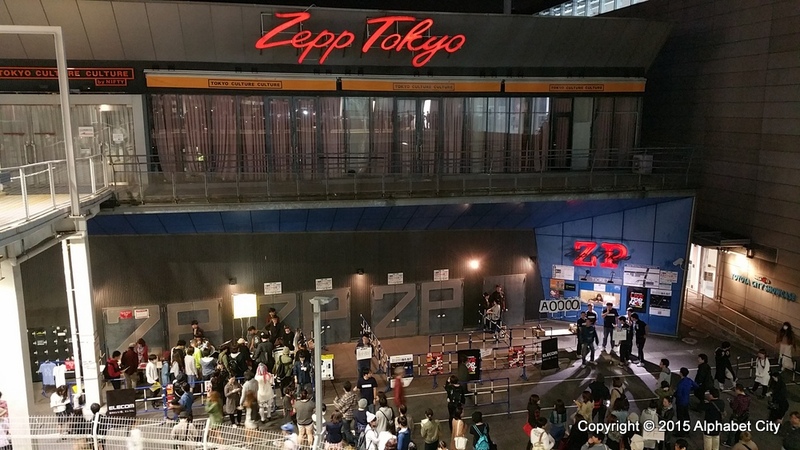 (We went to Zepp Tokyo the night after for Chara's Yen Town Band, although that's another post.) 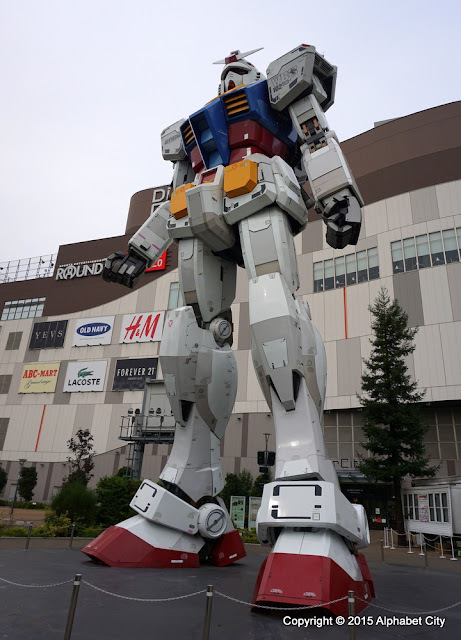 Both venues are in Odaiba, one of my favorite areas in Tokyo, and within walking distance to our hotel, which was pretty awesome. Zepp DiverCity is right behind the giant full-size Gundam that the area's sort of famous for. It's literally inside a mall, with a giant food court right next to it. How many rock clubs have a food court? It feels kind of like going to a 1980's mall multiplex. 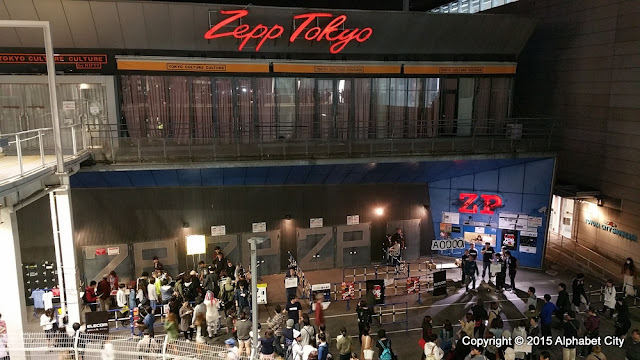 We did have to wait outside for the show, though - and I'll write up a lot more about the general Japanese club show process and experience in my Yen Town Band post. 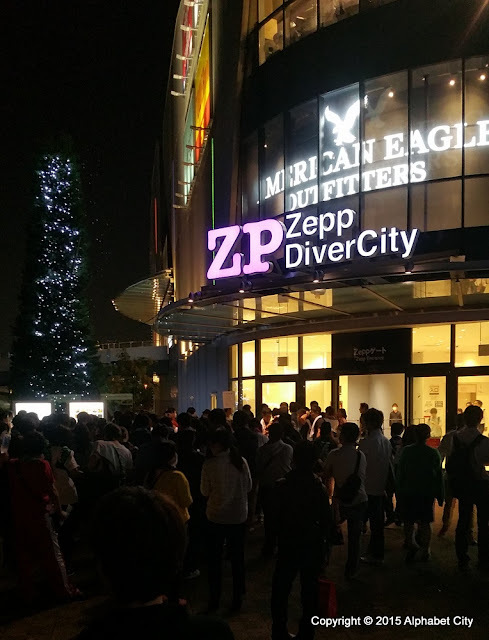 Things were pretty chill at DiverCity because the crowd wasn't actually that big, but Zepp Tokyo was a lot more hectic. We got our tickets to SCANDAL from e+, the official ticket seller, and by the time we did we had a pretty high number, so we were lucky to get pretty close to the stage (about 8 heads deep) with a railing to lean on. The venue was not full, which was surprising for a couple of big bands. I don't think SCANDAL advertised this show all that much, and anyway their fans would know it's a small show and probably a short one. Still, these days you don't get a lot of opportunities to get really up close at one of their shows without getting very lucky, so I'd have thought the place would have sold out. The band looked exactly the same as they did at Rock in Japan Fes. 2015, if you can't tell by the photos. FLiP: To be honest, I didn't know who they were the entire time they were on stage! I've heard of them and seen pictures, but I don't know their music and I'd never seen them play. They rocked pretty hard, though. They feel a lot more like an American indie rock band than SCANDAL does these days, and I dig that. They're raw and unpolished, but in a good way. They only played three songs, but they extended the last one for some audience participation, with the drummer coming out to rile up the crowd the same way Rina sometimes does for SCANDAL. Androp: There were actually quite a few people in the crowd who were there just for Androp - I saw a lot of Androp t-shirts being worn, and more than a few people left after they finished. But I just didn't get it at all. To me they sound like any generic Japanese rock band you could name; they're a walking stereotype. I suppose their distinguishing feature is supposed to be that they mix electronic music and rock (that's "genre-defying", apparently), but a lot of bands have done that over the past 20 years - it's not unique. I found their melodies unsatisfying, their songs mostly boring, and their stage act predictable. They're like a Japanese Jesus Jones. When I saw SCANDAL on the STANDARD tour, they practically blew the house down with their opening song (the title track to STANDARD). "Stamp!" does not have that same effect, and in fact the mix was strangely quiet - I'm used to them being very loud but this was almost like listening at home. Thankfully they got louder as the show went on. I will say that the crowd was into it from the start - now that I've seen a few more Japanese bands (in fact seven bands in two nights on this trip), I can definitively say that SCANDAL's fans are easily the most nuts about the music. 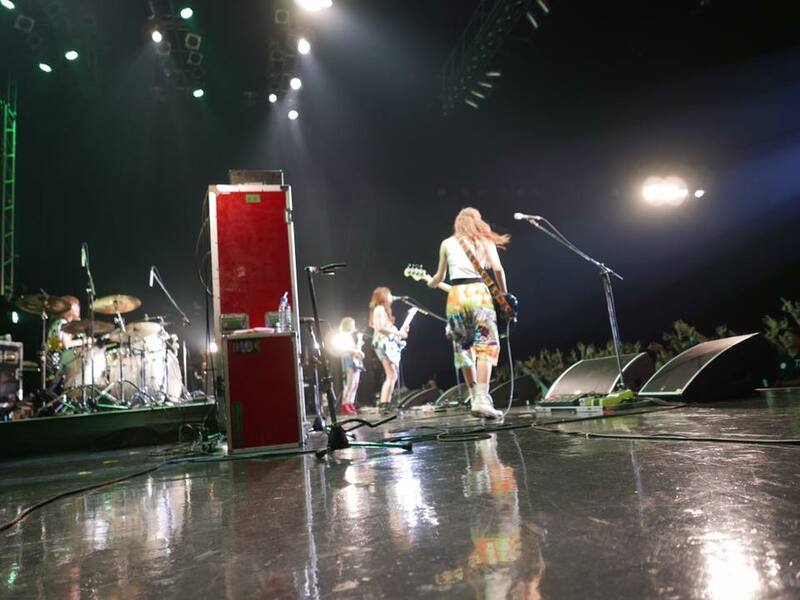 SCANDAL somehow can get the whole place jumping in a way that no other band can. From "EVERYBODY SAY YEAH" through "Shojo S", it was like the SCANDAL of old. In fact I was a little surprised at how many old songs they chose to play at such a short show, but I was happy that they did. "DOLL" served as the towel-waving song at this show, and luckily this time I managed to buy one so I finally got to participate. It's surprisingly tiring! All of their old songs sounded heavier than they do on the albums, and I think "DOLL", "Shojo S" and "Shunkan Sentimental" sounded better than I've ever heard them before. They were very crisp and had that nasty attitude that the band used to have but that you rarely hear from them anymore. Haruna's voice has also just gotten better and better since her pre-Budokan vocal troubles, and she's easily hitting all their high notes now with no problem at all. Maybe for the first time, I felt like I was really seeing the same band sing these songs as I saw in their original promotional videos. Even the choreography for "Shojo S" looked better than I've ever seen it - and it's always one of the most fun things to watch anyway. Haruna obviously loves to do it - I wrote in my Budokan report that she seemed a little over it, but this time she got completely giddy when they started doing those kicks, and all of them were in perfect unison and really put their whole bodies into it. With a short show, no need to save energy! I missed a bit of the MC but what I did catch sounded like the standard stuff they say at every show, with nothing extra except a couple bits about the HELLO WORLD documentary and their upcoming arena tour. They hadn't prepared any little skits or special announcements for this short concert. Haruna dominated the MC; I don't even remember the others talking at all. 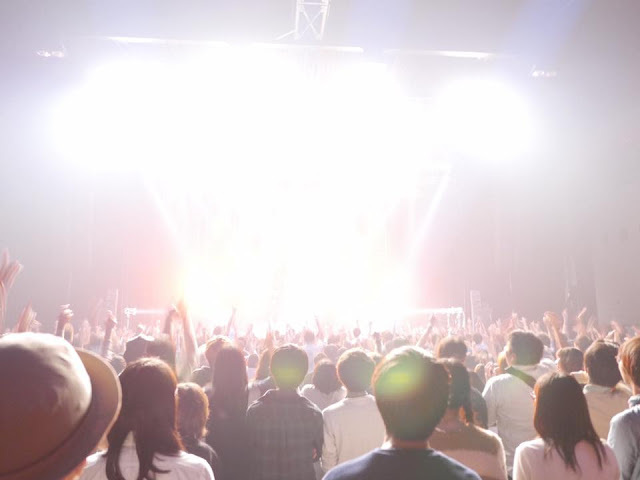 Rina fans would have been really disappointed by the entire concert - she was basically invisible from start to finish. At smaller shows the band seems content to just let their leader do all the talking. The second set was all newer songs, although they all sounded really good - even "Sisters", which is... not my favorite. It works a lot better live than on a recording - if you've seen the video, it really is like that (except their concerts have a lot more guys in the crowd). 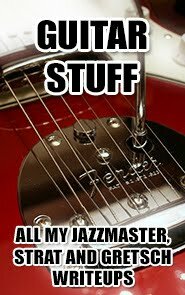 It's a song tailor made for pogo dancing. And they played it perfectly. "Your Song" was used for audience participation, as it was last year when I saw them in Nagoya. 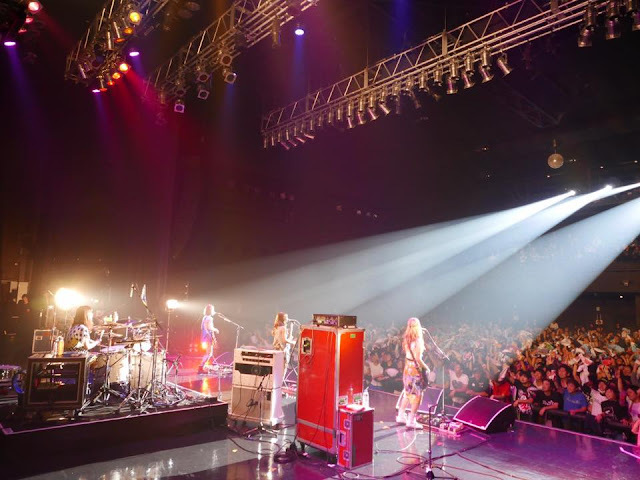 The "whooooa" parts were extended, with Haruna coming out to fire us up, but it wasn't quite as energetic as Nagoya and it was also a bit shorter (I wrote last year that I felt like Haruna led us into many more "whoas" than planned, just because she loved it). She also hit a couple sour notes on her guitar duet with Mami, which I could see her frown a bit over before shrugging and laughing it off. Overall it was a really good set for a short show, although I'd always rather see "SCANDAL BABY" in the set list somewhere, and preferably as the encore. * It was fun to see them in a live house setting, but they really "feel" like more of an arena rock band at this point, unlike FLiP. They're just really polished and professional, and they project seemingly beyond the walls of a live house. * The rest of the band is always consistent from show to show, but Haruna seemed happier, more relaxed and more confident at this show than at any other I've been to, including Budokan. Maybe it's the effect of getting the braces off? 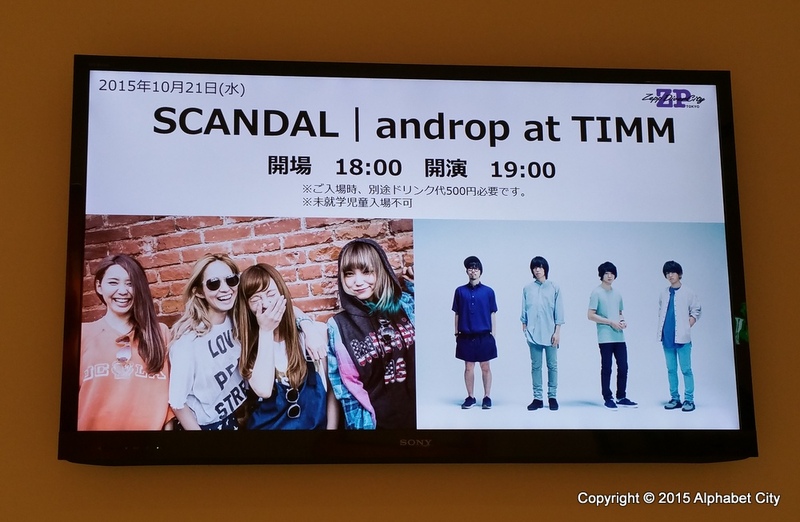 * SCANDAL's live and recorded personas are definitely diverging. Their releases over the last year have been pretty poppy, but live they are still a really straightforward rock band. In fact, at this show I felt like they had even finally found a way to channel their younger, more aggressive selves a bit to better fit their older songs. 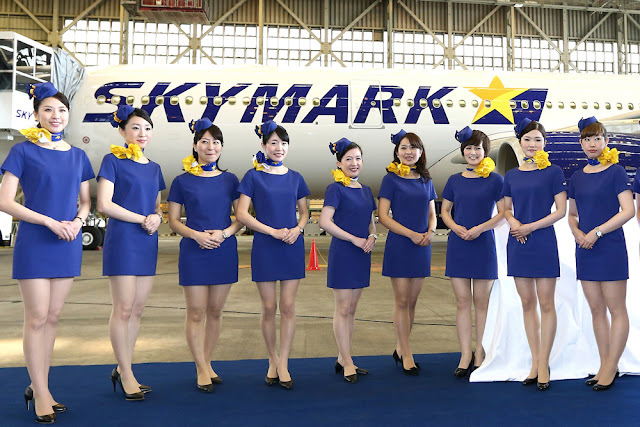 I have a feeling this might be the last time I see them for a while, barring something unexpected - I don't have another Japan trip planned for next year, and anyway my luck's going to run out at some point. I've now seen them play at least one of every type of show - arena, hall, live house. (I guess I haven't seen them play a festival, but that's ok with me - festivals are always a nightmare.) I wish I could have seen another of their big arena shows, but if my last time turns out to be seeing them play these songs this well, and this close to the stage, I can't really complain. 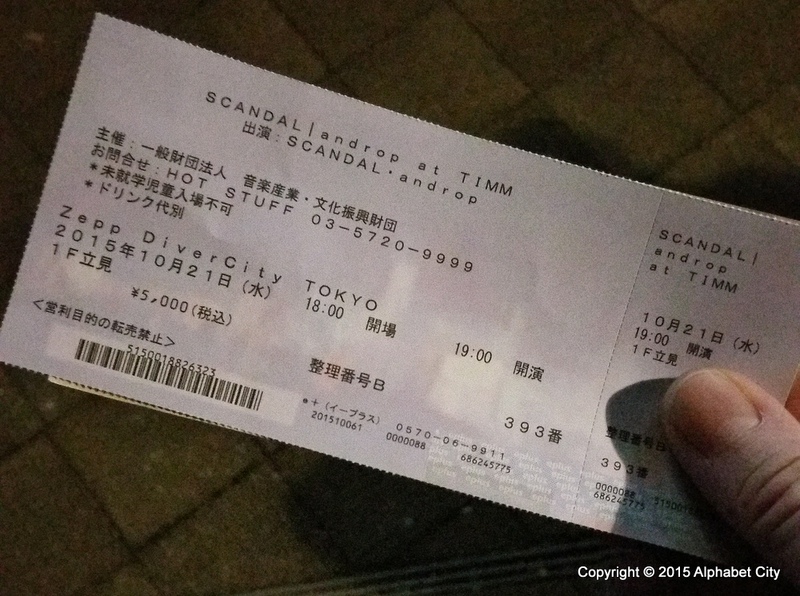 This is my fourth SCANDAL live report - read them all! I've previously flown and reported on ANA's business class, but for this trip there were no award seats available so I got stuck in First. The horror! I don't know how anyone can endure such hardship. If you want to know how to do this, check out The Points Guy or similar blogs - though be aware that it's getting a lot harder. 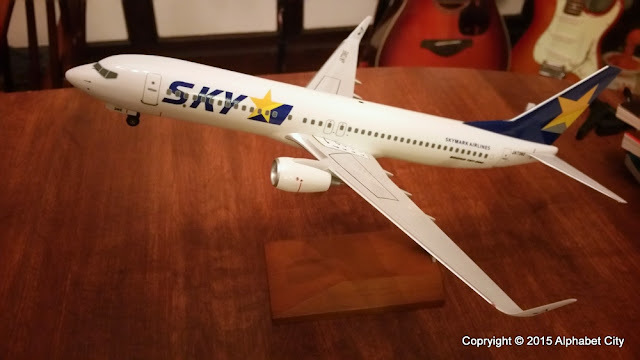 ANA's actually one of the few airlines left with reasonably attainable mileage requirements for award tickets, but they now severely restrict the available seats. When I flew business class a couple years ago, I basically had run of the cabin on any days I wanted. This time, I had no choice but first class one way, economy on the way back, and only on very specific days. 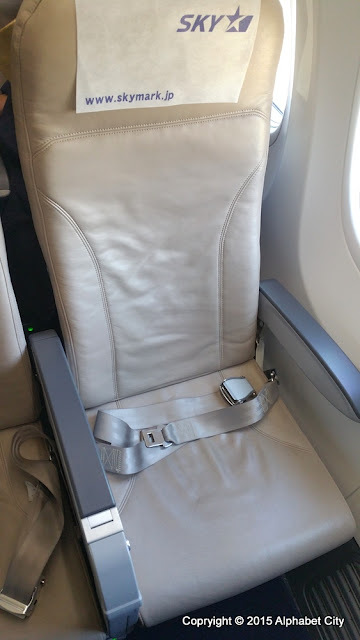 This despite a near-empty plane on the flight home.